Take control - don't be a slave to your cravings! Cravings are an intense longing for a certain food – some of our clients report that they can actually smell, see and even taste the food that they crave. Cravings are completely normal, with at least 60% of the population experiencing cravings at some point. However giving in to your cravings can seriously undermine your weight-loss programme. All the good work you’ve done with exercise and healthy eating could literally be undone in one craving-fuelled eating session. We understand it’s hard to deal with cravings – so we’ve put together some coping strategies for when that overwhelming need for chocolate hits you. Smash that Craving – Literally! If you find a packet of biscuits in your hand – get mad and literally pound them into dust before you chuck them in the bin. Get angry at the food you crave! You may worry about making a mess, but eating those biscuits will mess up your weight-loss plan. Smashing the food you crave puts you back in control – you are no longer a slave to the food you crave. Do you find yourself wanting a sugary snack or a bar of chocolate? Have something else instead – a nice cup of tea or coffee (without sugar of course), a drink of water, some fruit salad or a handful of trail mix. If your cravings are linked to stressful moments in your life, you need to manage your stress levels without resorting to food. If something is bothering you, you need to deal with it – not feed it! If you crave junk food when you are sad or stressed, you need to an alternative response to these situations. When something stressful happens, try calling a friend, writing an email or posting a Facebook status update instead of automatically reaching for food. Try meditating once a day. Choose a quiet place to sit comfortably, focus on your breathing and try to clear your mind of all negative thoughts. Concentrate on your weight loss goals – how you will feel and act when you’ve reached your target weight. Exercise is a great stress buster and can help you beat your cravings. Get your shoes on and go for a power walk, put some loud music on and dance, or do a few dumbbell presses. Anything that gets your blood flowing and your heart beating faster is guaranteed to lift your mood. You could even do a few simple exercises whilst waiting for the kettle to boil to take your mind off your craving. Does the food you crave really taste that good? Does it really satisfy you? No. It doesn’t – it’s just your imagination. Usually, after we eat a food that we have craved we feel worse, not better. You might feel bloated, and guilty that you have not stuck to your good intentions. The expectation that the food you crave tastes great is probably just your imagination – combined with the expectation of a quick sugar hit. Give yourself a reality check – focus on how you felt AFTER you gave in to a craving (bloated, disappointed in yourself etc.) and the craving may pass. Most cravings only last for 20 minutes. If you can distract yourself by doing something positive during that time, the craving will pass. Clean out that drawer, do a crossword, send an email, phone a friend or go for a brisk walk. Before you realise it, the craving will have passed and you will be one step nearer your weight loss target. Need more help with your cravings? 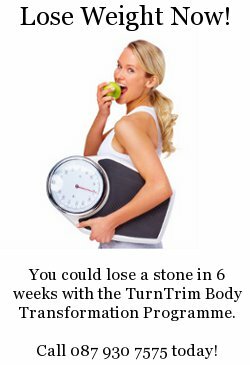 Our Body Transformation Programmes include a text message service that can help you beat cravings. Contact us for more information – or just give us a call on 087 930 7575. Next Next post: Sitting is Bad for Your Health!